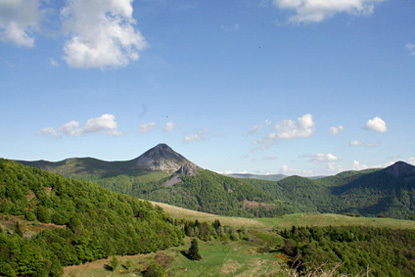 Expanding over much of the Massif Central, Auvergne is the land of volcanoes. Its dozens of picturesque verdant lava domes, that famously features on the bottles of Volvic mineral water, are one of France's great natural attractions. Slightly larger than the historical province of Auvergne, the present-day region also incorporates most of the old Duchy of Bourbon, also known as Bourbonnais (now forming the Allier department), and small parts of Gévaudan, Vivarais and Forez (all within the Haute-Loire department). 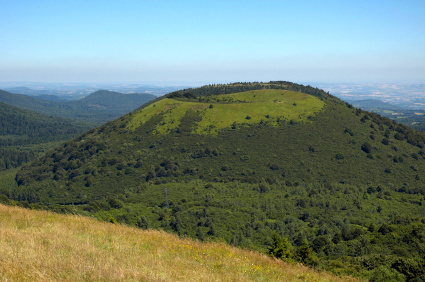 Auvergne is the least densely populated mainland French region after the adjacent Limousin. The Auvergnat dialect of Occitan is still widely spoken or understood by over half of the population. Cured pork, cabbage, lentils, potatoes and cheese play an important role in the local cuisine. Culinary specialities from Auvergne include aligot (melted cheese blended into mashed potatoes), truffade (a thick pancake made with shredded potatoes mixed with thin strips of tomme cheese), potée auvergnate (stew of cabbage, potatoes, lard and sausages), tripoux (sheep offals with vegetables and herbs), and bourriol (buckwheat crêpe). In the dessert section we find the tarte de Vic (tart made with curd, eggs, sugar an tomme cheese) and piquenchâgne (a kind of pear pie). The region also possesses several renowned cheeses, such as Bleu d'Auvergne, Cantal, Chambérat, Fourme d'Ambert, Gaperon, Salers and Saint-Nectaire. Famous people from Auvergne include (chronologically): the mathematician and physicist Blaise Pascal, the revolutionary leader Gilbert du Motier, marquis de Lafayette, the industrialists André and Édouard Michelin (founders of the Michelin company and guidebooks), President Georges Pompidou, the F1 manager and FIA president Jean Todt, and the TV presenter Claire Chazal. 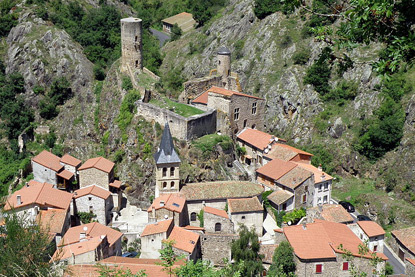 A beautiful small village inside the Auvergne Volcanoes Regional Nature Park. 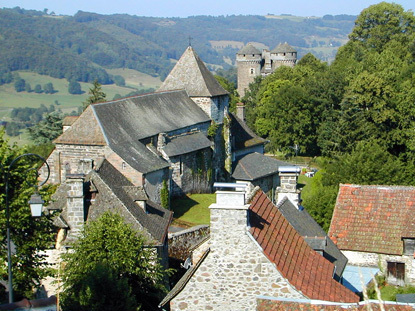 The medieval castle of Anjony, with its four-turreted keep, is the main sight. 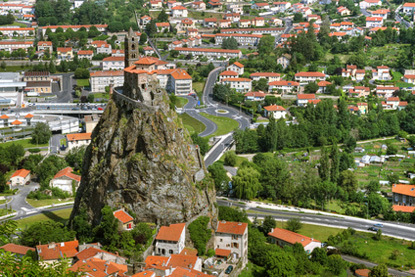 Le Puy-en-Velay is an attractive little town of grey-stone and colourfully painted façades. Its peculiarity are the two prominent rocks rising in the middle of town, on which were erected a chapel and a bronze statue of the Virgin Mary. The local Romanesque cathedral is a World Heritage site. Vichy's main attraction are its thermal baths, particularly popular among the 18th- and 19th-century aristocracy. 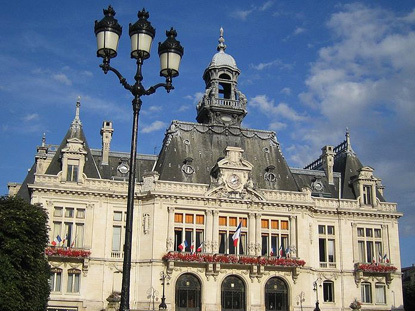 Vichy was the de facto capital of Vichy France during WWII. 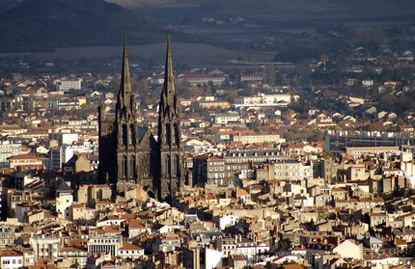 Clermont-Ferrand is the capital of Auvergne. The city spreads at the foot of the dormant volcano Puy-de-Dôme. It hosts the corporate headquarters of Michelin, the tyre maker and publisher of travel guides. Apart from the iconic black cathedral, visitors shouldn't miss the Basilica of Notre-Dame du Port, a UNESCO World Heritage site. A small medieval village constructed on a craggy slope.